At last. Here's the new Tomokawa's epic. I was waiting and shivering for it. The wait is over, but the shivers remain. Great. Just great. As always. The musical world nerver was so painful. The love songs never were so exhausting. About: "Latest album of devastating emotional transcendence from the Japanese underground’s most lyrical singer-songwriter. Full of classic, richly textured songs of love, loss and stunned acquiescence to the wonders of the world. Alongside Tomokawa’s regular collaborators Toshiaki Ishizuka and Masato Nagahata, the expanded group also includes Compostela-veteran Takero Sekijima on tuba and recorder, and improv-legend Hiromichi Sakamoto on cello." 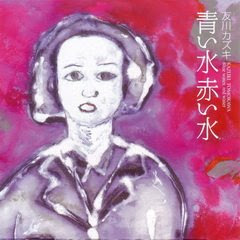 "Much-anticipated new studio album from Kazuki Tomokawa. More sonically advanced than his last few blats, the canvas here is expanded by a big band that includes Vajra drummer Toshi Ishizuka, as well as Masato Nagahata on piano, mandolin and accordion, Taro Kanai on guitar, Ayumi Matsui on violin, Takero Sekizima on tuba and recorder and Hiromichi Sakamoto on cello alongside Tomokawa on guitar and vocals. Indeed, the set feels a touch more overtly psychedelic than Tomokawa’s recent, more aggressively nuanced sides, with long instrumental passages bracketing his infernal vocal entreaties in a way that sounds most like the odd chamber arrangements of Ghost at their most baroque. But it’s Tomokawa’s vocals that remain the focus, with the kind of emotional gravity that is all but irresistible. Comes with English lyric translations. Highly recommended." PS usually i dont place here fresh stuff, waitin a bit for the official release to be if not sold out, then at least... errr... u know. but any Tomokawa's album is so long-awaited by thousands of his fans - i just dont believe that the pressings aint have that commercial success the PSF recon on. its scarcely possible. i think any Tomokawa's true listener, who have a possibility to buy the official release, buys it. not all of us can do it (dont tell me about postage - lots of us cant pay via web only due to the place of living). but for the rest of the world there's a deep appeal - BUY IT! could you please reupload Jandek files from another server? Thank you so much for this. It is a truly beautiful album. It is very interesting for me to read the post. Thanx for it. I like such topics and anything connected to them. I would like to read a bit more on that blog soon.